Hard to believe it but we’re getting down to the final days of the preseason. The 2012 MLS season kicks off this week! Yes, yes I’ll probably have to contain myself from writing that or something similar to it in each post this week but I am excited. I’m back on my positional rankings as we head into the new season. To recap, here are the keeper rankings from last week. A lot of you ripped me apart on them, which is all good. I did like one comment that stated just how deep MLS has gotten in goal. I really did feel like #s 5-16 or so were about as even as possible. A lot of it came down to depth and just what I’ve seen over the years out of those guys. Again, don’t take the rankings personally here. If your club is ranked low – it is just an opinion of mine – and I don’t mind being wrong in the end. Today we’re looking at the defenders of each club in the rankings. Naturally there could be some gray area with defensive midfielders and what not but I’m sticking strictly to those listed as a defender for these rankings. Defensive midfielders will be put in the midfielders group. Defense is where things are won and lost in this league. The deeper the defense, usually the better the club. I do believe though that a lot of clubs got better at defense this preseason so it will be interesting to see where they all end up at the end of the year, even if I have them low. 1. Los Angeles Galaxy – Yes, the Galaxy are going to be without last year’s MLS Defender of the Year in Omar Gonzalez but the group is still fairly stacked around that position and the guys that will fill the void of Gonzalez aren’t too bad either. AJ DeLaGarza is one of the more underrated defenders in the league, Todd Dunivent has always been solid and Sean Franklin is another quality fullback. They do get Leonardo back from injury and if he can return to his form that we saw early last year, there is little reason in my mind to think that this group won’t be leading the league in goals-against again. Also, lookout for rookie Tommy Meyer, he could be a dark horse candidate for Rookie of the Year. 2. Real Salt Lake – There may be no deeper club than RSL in the league and this winter was a true test for them when it came to dealing with the salary cap and roster restrictions. They did lose Robbie Russell to DC but in a salary cap move that won’t be a bad thing down the road. They still have probably the best two center backs in the league in Nat Borchers and Jamison Olave and Chris Schuler is looking like he’ll be a stud for them down the road. The depth on the outside is questionable but not horrible. 3. FC Dallas – When George John came back to MLS last week it showed one thing, Dallas would be all about defense this season. Schellas Hyndman went out and got a defender in the draft (Matt Hedges) and two in the transfer market (Hernan Pertuz and Carlos Rodriguez), not to mention he also got a couple young guys for depth reasons behind them (supplemental pick Alex Lee and Christian Igeabha). But consider this, last year this group came into the season banged up and didn’t get off to a good start in the process. This year, they’re all healthy and deeper than ever. 4. Seattle Sounders FC – They lost James Riley but picked up Swede Adam Johannson and Marc Burch. The core of this group is still there with guys like Jhon Kennedy Hurtado, Leo Gonzalez, Patrick Ianni, and Jeff Parke. Their depth is a bit young but you can bet Sigi Schmid will use them at some point in the year in the Open Cup or Champions League games to get them time on the field. 5. Houston Dynamo – The main four is about as strong as it gets in MLS, especially in the middle with Geoff Cameron and Bobby Boswell. The fullback depth is a little thin and things could get interesting this summer during the Olympics. But, there is talent (though it’s a bit young) behind the main group. The big wild card could be newcomer Nathan Sturgis, who has filled in the center of defense some this preseason. I’ve always thought highly of this kid and think Houston could finally be the place he makes a name for himself in this league. 6. Sporting Kansas City – Depth wise in the middle is iffy but Matt Besler and Aurélien Collin are two of the more underrated pairings in the league in the center of defense. The big key won’t be depth for this group but the mental stage. They gave up a lot of goals late in games last season and will need to get over that hump this year if they plan on being a big time contender in this league like many think they will be. 7. Philadelphia Union – Just like in 2011, the Union lack a lot of numbers in defense. But given how things went in 2011, we can’t count them out for that reason alone. Porfirio López will add some solid strength to their fullback positions and adding Raymon Gaddis and Chris Albright are good depth pickups. Sheanon Williams, Danny Califf and Carlos Valdes should continue to be strong for this club, as they were in 2011. All three are leaders and Califf is now the captain. 8. Colorado Rapids – This group quietly got better this winter. Hunter Freeman comes over from Houston and could secure the left back spot that has been troubling this side for a season now. Drew Moor and Marvell Wynne return to the middle of the defense. Keep an eye on newcomer Luis Zapata, the Colombian could be the biggest wildcard on this team for 2012. He’s got the skills to be an impact player for the Rapids this season if he can adapt to the MLS style of play. 9. Columbus Crew – I feel like this is a low ranking considering the fact that they still have one of the best pure defenders in the league in Chad Marshall. They do have some questions at fullback with Shaun Francis and his health, but as long as he is fully fit this team stands to be in a lot of games because of their back four. Adding Carlos Mendes from New York was also a big move too, one that could pay off in a big way if he and Marshall can form a good partnership in the middle. 10. Chicago Fire – I’m a big fan of this group and really believe it will be their strength this season. Jahil Anibaba and Cory Gibbs are solid center backs but their depth is a little thin behind them. I do think Frank Klopas knows this and will address it at some point. Keep an eye out for rookies Hunter Jumper and Austin Berry this season too, both could play a pivotal role in their defense this season. 11. Toronto FC – Yeah, this one feels high but it also doesn’t seem too far off base. I like their additions in the back in Miguel Aceval and Geovanny Caicedo. Ashton Morgan doesn’t have a ton of depth behind him but as long as he remains healthy they should be fine, plus he’s a stud in the making for them up there. Once some players like Adrian Cann and Dicoy Williams return from health, this group will have some strong depth to use in what will be a busy season for Aron Winter. 12. D.C. United – Brandon McDonald and Emiliano Dudar will have to form a good partnership in the middle for United this season. Luckily for Ben Olsen his center backs are fairly deep. However his fullbacks aren’t quite as deep as he would like them to be. Adding a veteran like Robbie Russell though was a good move for them and if this group can remain healthy they could push their way up these rankings by the end of the season. 13. San Jose Earthquakes – The main four is what will keep this team in games this season. Ramiro Corrales, Steven Beitashour and Jason Hernandez are absolute key to this club. The big wildcard will once again be the health of Ike Opara. He’s looked great so far in the preseason with the U-23 national team but can he put it together for a full season? That will be key. 14. New York Red Bulls – Health will be key for this bunch and I think by the seasons end this will be a higher rankings. Just how good will Wilman Conde and Markus Holgersson be in the middle for this team is a big question. Conde comes into the season banged up a bit, which is not a good sign. Their fullback depth is a bit thin too. 15. Portland Timbers – Hanyer Mosquera seems like a solid addition that will help solidify their center back issues from last year. The big questions will be out on the fullback spots though. They have quality players in Lovel Palmer and Mike Chabala but at times both showed that they can get beaten easily with pace. Portland was a team that could get beaten easily on the wings last year and will have to improve or else Eric Brunner and Mosquera will have their hands full in the middle. 16. 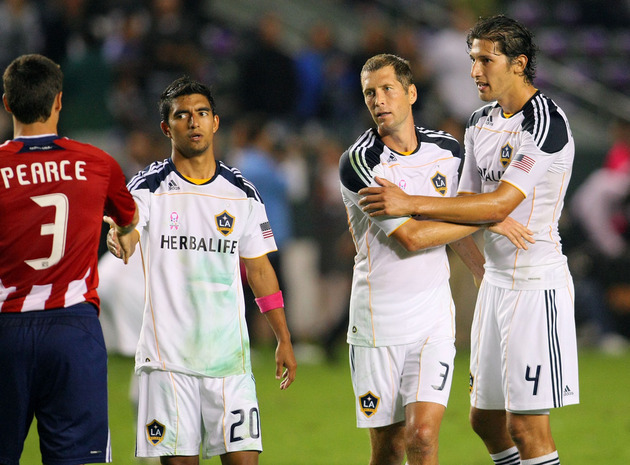 Chivas USA – Heath Pearce in the middle just works and in a way this ranking feels low. The addition of James Riley adds some solid strength to the fullback position. But man is this group thin after their main four. They have some capable players but none that have played any serious minutes in MLS before. 17. Vancouver Whitecaps – They looked good in the preseason. But it was the preseason. Lee Young-Pyo looked good and could be an All-Star but he will still have to make the adjustment into MLS. Jay DeMerit will need to prove he can last a full season as well. Their depth at the fullback position is scary thin too. That being said I do think this group will improve by leaps over last year’s dreadful bunch. 18. Montreal Impact – Health of the big names like Nelson Rivas and Matteo Ferrari will be key for this group. Don’t sleep on the young guys like Zarek Valentin or Josh Gardner though, both could be impact type players for this expansion side. This group has plenty of decent players but it remains to be seen just how good the group will be together over the long haul. I’d expect plenty of growing pains early on. 19. New England Revolution – Still loads of questions out of this bunch. The talent is certainly there with AJ Soares and Kevin Alston. But the depth is lacking and should injuries hit this squad again it will put pressure on new manager Jay Heaps. The big key will be Darrius Barnes, if he can get motivated and push the starting four it will do nothing more than help this group out at the bottom line. Wait, RSL’s fullback backups are “questionable but horrible”? One thing Italian soccer players know how to do is defend. I feel that the Impact should be a bit higher, though I get why they aren’t. FYI, Mendes is pegged as the staring LB, while O’Rourke is the starting CB. I agree that Houston’s strength is defense, but that’s because of Cameron and Hainault (despite his mental lapses). Boswell is still slow as molasses, and Sturgis is made of glass. Neither player inspires confidence in the event of Cameron or Hainault’s absence.